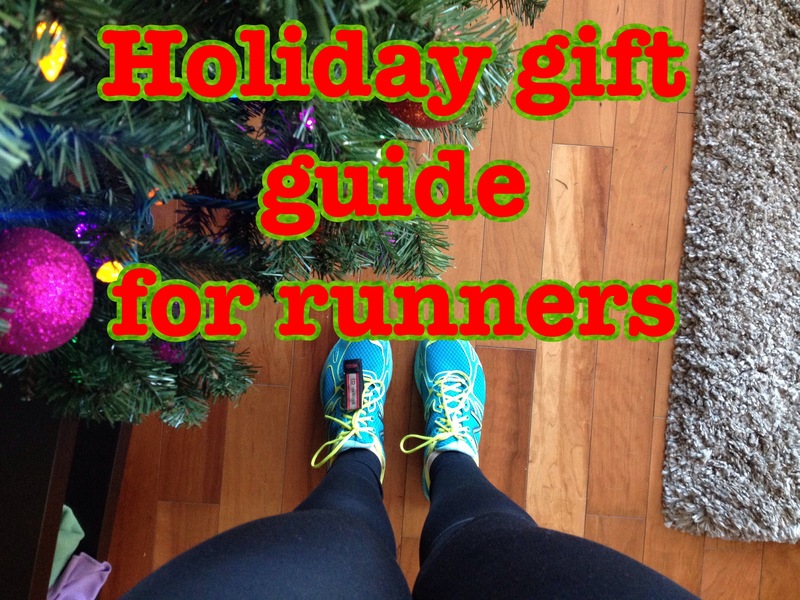 With the holiday season here, I was inspired to make a mini holiday gift guide for the runner in your life! Pretty easy right? wrong. Make sure you know the exact size, brand and type of runner they wear! There isn’t one single shoe out there that will fit all. If there is no way to figure out the size, brand or type of runner, a gift card will always be appreciated! Running gear can make a runner more or less comfortable. With various climates and body temperatures, sometimes cotton will be the enemy. Cotton also can create grounds for chafing. No bueno. No need to spend crazy amounts of money on the big brand names. I find places like Wal-mart, Target, Winners, TJ Max and other discount stores have really great technical gear that is affordable and fashionable. Make sure the clothing can breathe and doesn’t have any crazy looking seams (no one likes chafing! ouch!). 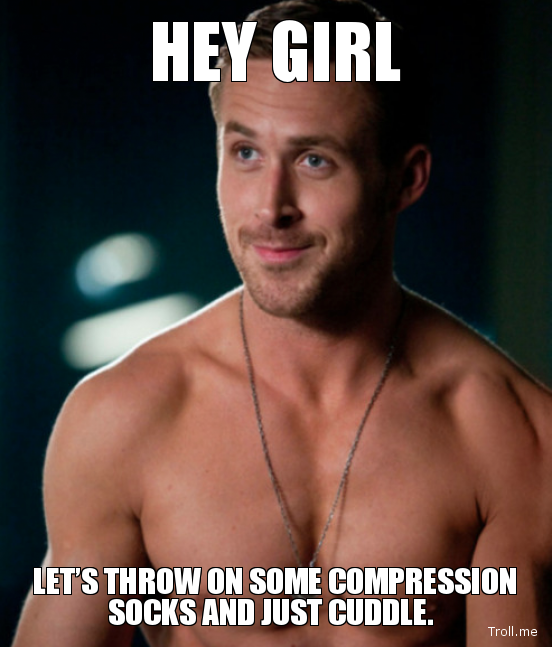 Compression gear! it gets mighty pricey at times but can have some benefits. I am a huge fan of CEP compression calf sleeves and socks. Also, there are some really great compression tights and crops out there too. For my winter runners, gloves that have the ability to still use touch screen electronics are seriously the best invention ever. Most of us run with either an ipod or smart phone these days! Does it snow where you are? find a good pair of gators or spikes that can be strapped on over runners to avoid getting snow in the shoes and avoid slipping! also finding toques (or for my American readers, beanies) or ear warmers/head bands are great. If you are shopping for a female runner that has long hair, you can buy many of these hats that have a hole to accommodate the ponytail! Dandy and looks like you have a squirrel on your head (what? totally does! think about it). The COOLEST stocking stuffer ever? socks! what? everyone wants socks! okay maybe not everyone, but socks are a huge deal to runners and there are so many types out there! ankle socks, compression socks, double layered socks, thin layer socks, socks with support around the arch, etc! It is always good to have extra running socks around! Above all else? BODY GLIDE or any other anti-chafe stick/cream. Once you get to a certain distance or time out on the road, many runners experience horrible chafing! Chafing from anything! Believe me! I have spots on my lower back STILL from my ipod creating friction on my waist band. These anti-chafe sticks are a blessing! I can’t stress the importance of being as visible as possible. There are so many times I have had close calls with drivers who aren’t paying much attention, and it is hard to see into the card to get eye contact when it is on the darker side. Make sure you and your loved ones are properly lit! There are so many options: lights, reflective strips, knuckle lights, head lamps, reflective vests and much more. Every runner needs some kind of reflective equipment! If you have a half, full or ultra marathoner on your hands, a fuel belt, a box of gels, new bottles or flasks may be a good option as well. Just be sure it is something they truly want. Like most of us, we have our preferences. It can be as technical as shopping for a purse (am I right ladies?) I personally am a fan of the 2 10 ounce bottled holding fuel belts, but some may prefer the 4 7 ounce bottled belts. Or there are hydropacks as well that are more like a back pack with a long straw! Make sure to get their input! My, now husband, did this for a Birthday gift one year and I was very thankful. Registrations can get expensive! If you have a race bling addict on your hands (hey! we like our medals okay?!) then this will be a big help! Just be sure they have yet to register otherwise you may be running along side with them! I spend a good chunk of money on music. When you are out on the road for a while and do not have a training partner, sometimes music and a podcast are what get you through those days where mother nature is throwing every headwind possible at you. Not all runners listen to music, but I know many that do. I personally love my ipod since it has FM radio on it and it clips onto my belt (older generation) and nothing beats finding ear buds or headphones that do not budge! I am a huge believer in safety. I have been on the road with runners where something does go wrong and medical attention is needed. We don’t always run with a partner or group, so what happens if something bad were to happen? It is good to have ID on you regardless of how far of a run you are going for. There are many options from bracelets, to shoe tags, to writing labels for your clothing. Have you heard: the hardest part is getting out the door? It is really true sometimes with us runners. Motivation and keeping your eye on the prize can be tough when its snowing out. So motivational pieces are key for people like myself. Before EVERY marathon I run I watch Spirit of the Marathon (the first one). Okay, maybe I am a tad superstitious and that is why I watch it before each race..I have a whole set routine! But it is the most inspiring running documentary. For the people with running readers on there hands, there are also some great books (and audiobooks for ON THE RUN 😉 ) out there for runners to learn and improve their running, or even just to read about other runners stories and get inspired. I was gifted this one year and honestly it was a great gift. Running magazines are one of the few fitness type magazines I will actually read, and learn a bit from. Plus they are affordable for the most part! Now this is the more pricier gift on this guide, so it may be something you want to go halfsies on. Again, make sure you know what your runner wants. Various GPS watches are a great tool to have but know that not every runner is into the techy side of things. Also, there are so many models out there and they all serve various functions. Make sure to ask many questions or at least get a gift receipt. As we know, running can be physically and mentally demanding. Do you see where I am going with this? *ahem* SPA DAY *ahem* As gnarly as our runner feet can be, we like a good pedicure. Don’t even get me started on how awesome a relaxing massage can be! or if we are in the midst of training? SPORTS MASSAGE. We will love it!!!…err.. okay maybe AFTER the appointment after all the knots have been poked and kneaded out of us! For the runner that has a large collection of racing bling, I suggest a medal wall hanger. There are so many out there of various sizes, colours and various motivational sayings! I absolutely love mine! Sometimes the negativity monster bites the best of us. Sometimes we dig ourselves a huge pit of self loathing which sometimes feels impossible to crawl out of. 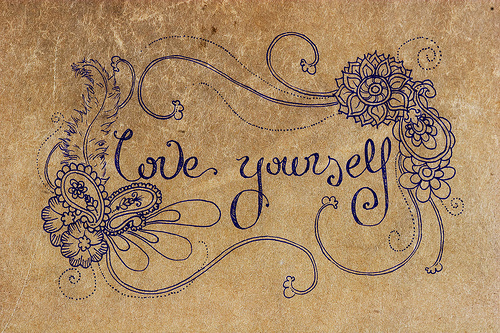 Ever since starting my journey, I learned the importance of learning to love yourself for what you are and who you are. The only thing in life that we can be our absolute BEST at is ourselves. So what happens when you aren’t cheering on your own side? Everything is an uphill fight. Everything seems way harder than it should. That spark and spice for life seems dull and dim. We all need that reminder from time to time. Even the most positive and uplifting people have those times of doubt, worry and self consciousness. I want to share with you some of my tips on how I crawl myself out of my own pit of negative self-talk! This tip is super difficult at times. We are constantly bombarded by media outlets on what the “perfect body” is and what it should look like. But you know what? We were only given one body. This body carries you from point A to point B and beyond. This body has been through the tough time and the best times! Why not feed it love and peace? Work with what you have and love it for what it is! There is no such thing as an ugly body! Every body is a beautiful body, feed off of that and work yourself the best your body can allow for you! Every one is different. Every one comes in different shapes and sizes as we learned back in our preschool days! So how can one compare their body to another that is a foot taller and of totally different proportions? you just can’t! Do with what you have and love every moment of it. Tip #2: Don’t play victim. Take control of your life! My life is so tough! I will never be able to catch my dreams! I can’t do ____ because of ______. I’ve heard these time and time again and you know what? No one has ever been dealt the perfect cards. No one has ever had the easy path carved out for them. You can’t complain about something you don’t like if you haven’t put the effort in to take control of the situation. You want to lose weight? change something and make it happen! You want to run a marathon? well, find a run group or a program to slowly progress your way to that goal! Nothing is impossible with some time and effort! Now go get ’em tiger! I have learned over the years how contagious other peoples behaviors and attitudes can be. I have also learned not to put up with other peoples negativity. If you have someone in your life that has caused you pain or stress. Talk to them! If they refuse to take responsibility or talk it out, it may not even be worth the time so move on. Surround yourself with people who compliment your goals and your attitudes. These people will raise you up and you will raise them up as well. Positive relationships are a total game changer. This may sound silly, but saying something nice and smiling at someone can make someones day. Not only will it make their day but it will lighten up your day as well. Pass the positivity on! Write down 5 things right now that you are grateful for. It may be that you are grateful for your spouse, your health, your children, mobility, anything! Gratitude shows us what we have in our lives and opens our eyes up to what we do love about ourselves. This one may sound cheesy to some, but I often will take myself onto the sidelines for a little self pep talk. I run myself a hot bath, or make myself a big cup of tea and take out my journal. I ask: Why do I feel this way? What can I do to fix this feeling of negativity towards myself? What can I do right now that will change my mindset around? What things do I love about my inner self and my physical self? Why being positive and open will benefit me? Sometimes this is all we need. We need to step back and take a look at the broader picture! A little “me time” is always good to have. Sometimes a little pampering is in order too! Hot bath, face masque, Tea, a book and an hour alone. Gives you time to relax and take your mind off things. Heck! Maybe book yourself a massage! Think about all the things that have changed for the better over the years. Maybe you have picked up running, you’ve lost weight, you have stopped smoking. If you have a journal you kept from those years or photos, look at these as a reminder. Sometimes we forget the leaps and bounds we have made because we get too stuck up in things not happening fast enough and looking to the future. Remember the importance of celebrating your past and current accomplishments. You need to be your biggest cheerleader! Are you really surprised that this is a tip? WORKOUT. The high after a workout is the best for your mindset. Have you really ever worked out and went “GOSH I WISH I DIDN’T DO THAT. I SHOULD HAVE JUST SAT ON THE COUCH ALL DAY INSTEAD!” I highly doubt it. Working out gives you confidence, clears the mind, gives you energy, and creates a mind-body connection that I feel sometimes is lost when we are in these times of self-loathing and self consciousness. Tip #9: Motivate and Inspire yourself! Personally I use social media to motivate and inspire myself. I follow so many amazing men and women on Instagram that work so hard for their goals. I also read blogs, watch YouTube videos and Pinterest! Find what inspires you for whatever your goals are and work with those. But remember not to compare yourself to whatever is inspiring you. Why yes, Jenn, I breathe almost ALL THE TIME. Yes Yes, I know. But taking a few deep breaths can open up your mind and give you a second to calm yourself. I will often give myself 3-5 minutes to sit down comfortably, sit up tall, and just focus on my breathing in and out. That can be all we need when we are having a moment!